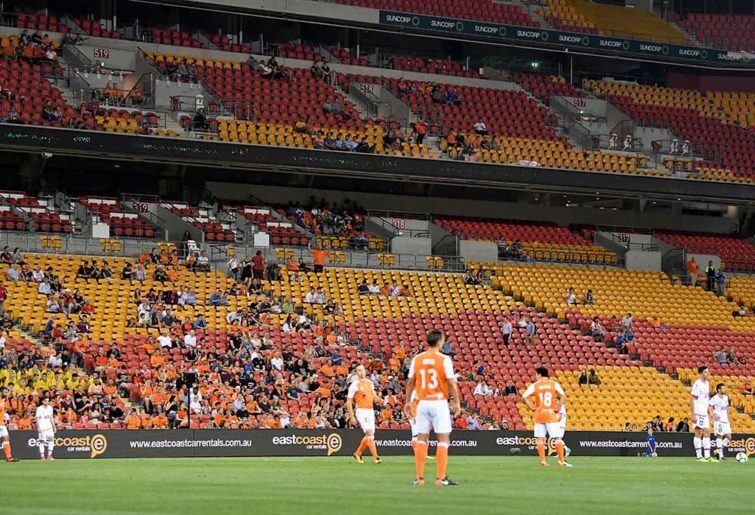 The recently released Stadium Taskforce report commissioned by the Queensland government has thrown a spanner in the works for future A-League expansion. Not only does it recommend that no new stadiums be built in Brisbane, but it recommends Ballymore’s grandstands be demolished as well. A second Brisbane A-League side would most likely play out of Ballymore in the case of Brisbane City, or Perry Park in the case of Strikers. There would also be a third possibility for a team in Ipswich, but none of these will happen in the face of the final report to the government. In its conclusions, a new stadium wouldn’t be necessary for either a second A-League side or a second NRL team or even for major one-off events such as the FIFA Women’s World Cup. According to the report, “There is current capacity for additional content within the existing venues”. It goes on to say that, “It is more fiscally responsible and viable for the state to maximise the utilisation of Stadium Queensland’s existing major sporting venues instead of constructing, managing and operating new assets”. In other words, any new A-League or NRL side will have to play at Lang Park since the Queensland government won’t be funding any new stadiums, boutique or otherwise. It won’t even be possible to use Ballymore in the future as it is set to be turned permanently into a 5000-seat suburban ground which will be repurposed primarily as a rugby union national centre of excellence. According to the report, the “Ballymore venue is more aligned to being a training, club participation and administrative hub for rugby and compatible sports as opposed to being a location for a major stadium”. Transport and access problems were other major issues with using Ballymore for major events, with the report citing, “limited road access to the site” and “no access to scheduled high-frequency and multi-modal public transport”. In addition, the Queensland Rugby Union’s preliminary plans for a bridge that would allow fans to get to the stadium from Wilston Station hasn’t received any funding from either state or federal governments. Ballymore wasn’t the only stadium affected by the report’s recommendations. The Queensland Sports and Athletics Centre is targeted to be greatly reduced in capacity by removing the temporary stands at both ends, with the report saying that, “The cost of maintaining these stands is inconsistent with the amount of use they receive for one-off major events”. Another stadium facing the chop is the ageing Brisbane Entertainment Centre, with the report saying, “The location of the Brisbane Entertainment Centre does not meet contemporary standards for a major entertainment facility, including limited access to scheduled high-frequency and multi-modal public transport”. The demolition of the Brisbane Entertainment Centre will see the Brisbane Bullets NBL team relocated to the new $2 billion Brisbane Live precinct at the redeveloped Roma Street rail yards, which is linked in with the Cross River Rail project. Upgrading The Gabba is seen as essential to continue competing for content against the MCG and SCG as well as Adelaide Oval and the new Perth Stadium. A new Cross River Rail station at the ground will be another improvement in its favour for achieving this. As for Lang Park, it too will receive additional funding. According to the report a new western grandstand will be needed at the venue within the next ten years to compete with new stadiums in the southern states. As it says in the report, “Redevelopment of this stand would significantly modernise the venue and elevate the corporate and premium seating offerings to a new level comparable with new southern venues”. So what does this all mean for A-League expansion? In a nutshell, the Queensland government’s priorities are about focussing on upgrading Lang Park and The Gabba as well as redeveloping the Roma Street rail yards into the new Brisbane Live precinct. They will not be diverting hundreds of millions of dollars towards Ballymore, Perry Park or Ipswich. If a new A-League team is added to create a Brisbane derby, they will have to use Lang Park whether they like it or not unless a bid group is willing to fund a stadium privately. Since FFA won’t want to risk creating another Melbourne City, it is very unlikely that a Brisbane derby will be possible. This might leave FFA with the choice of adding Gold Coast United as the only option. Meanwhile, in south-west Sydney, the NRL club Wests Tigers have suddenly woken up and realised the importance of the area as a growth corridor and are considering entering into a “partnership” with the new A-League team based there. If the lack of competition from other codes was a reason for adding a team in south-west Sydney, the advantage might not have lasted long. With the backlash against the A-League becoming heavily Sydney and Melbourne-centric and Brisbane seemingly off the table, that might leave only Canberra, Wollongong, Tasmania and the Gold Coast as the next locations for expansion. At the same time, West Melbourne will be playing at a 36,000-seat oval ground in Geelong for three years and the new team in south-west Sydney will have the Tigers breathing down their necks in Campbelltown. I wonder what the NPL clubs will make of all this?